Although a somewhat lesser light, there’s also my personal favorite Cardboard God Richie Hebner in the pantheon of ’70s 3Bs. I took in a Gwinnett Braves game last week and my friends and I were overjoyed to see that Hebner was the batting coach for the opposing Norfolk Tides. We debated for a while about who was going to lean into the dugout and say “Hey pudlips, you pack flame?”, but decided discretion was the better path. Funny, I feel the exact same way now about the Oakland Coliseum itself. It used to be a beautiful thing, but now, there’s Bugs Bunny tearing up the countryside beyond the outfield fence. It’s a badly drawn hat on a nice old photo. Good point about the golden era of 3b during the “Cardboard Gods” era. Although you left Darell Evans and Buddy Bell off the 3b list from the cardboard era. I would probably rank Eddie Mathews 2nd all time at 3b. Then you have Paul Molitor who started about 1/3 of his career at 3b and Wade Boggs, whose career started right after the cardboard god. Then you have Eddie Mathews and Ken Boyer whose careers ended right before the cardboard gods era began. Schmidt, Mathews, Brett, Boggs, Santo, B. Robinson, Molitor, D. Evans, Nettles, Boyer, Bando, Bell, and Cey. There’s really only 2 players, Home Run Baker and Stan Hack, that crack the top 15 that didn’t play from 62-87. Scott Rolen has cracked the top 15 but is still active. I forgot about Chipper Jones, he’s in the top 5. Bando really should be a borderline HOF candidate, but they basically don’t elect 3b to the HOF. He ranks 105th all time in career WAR among position players, which is really impressive. 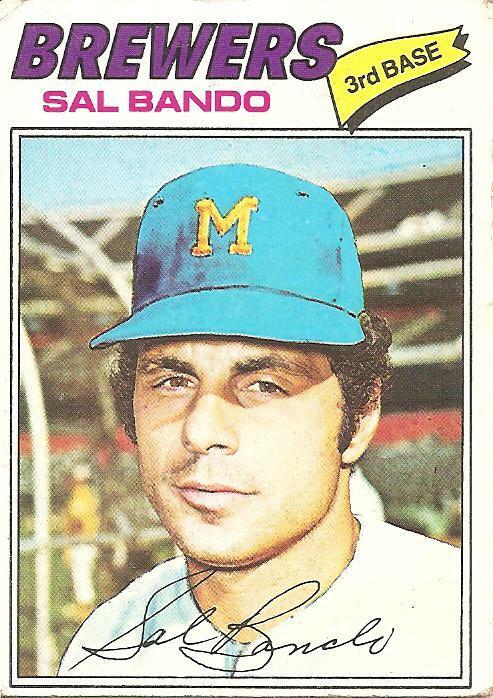 C’mon, man, when your name is Sal Bando you don’t need a nickname! His name just rolls off your tongue, it sounds like a single Spanish word for, I don’t know, maybe a relaxing vacation, or a comfortable type of shoe. PeoriaBadger: You know what, you are totally right. I guess I was just thinking of him in comparison to guys with outrageous facial hair and Superduperstars, etc., but he too held a distinct place in my little kid mind for sure. When I was a kid I had a Sports Illustrated Salvatore Bando Poster from his first year with the Brewers hanging on my wall. Still got the poster stashed away in storage. He was the Brewers first real hope for legitimacy after way too many Tim Johnsons, Pedro Garcias, Ollie Browns and Bob Sheldons. It was a bit of an odd signing considering the Brewers already had Don Money at 3B, but it was more the fact that the Brewers needed a leader – someone to show them how to win. I seemed to get a lot of Sal Bando cards, so he definitely held in place in my imagination. I mean how could it not work?? Amen, ramblin’ pete. I can see him in a dirty butcher’s apron now. 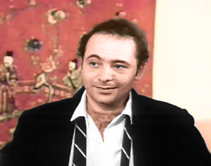 It’s hard not to picture Burt Young as a last-minute casting replacement, however. That airbrushed cap on Bando’s head is a disgrace to everything that I stand for. Who worked quality control over at Topps? Probably some guy who was trying out his one-hit pipe in the alley behind the building. As a kid, I remember all the A’s cards with all-star designations. God, what a great team that was. Nearly an all-star at every position. And the green and yellow uniforms really gave their cards a lot of color. Those A’s cards from the 1970’s really stand out in hindsight. I received your book in the mail today. It’s excellent. I’m going to post about it on my blog shortly. You’re the first author I’ve read who has given voice to the connection between collecting baseball cards and childhood not only by way of nostalgia, but by examining the emotional intelligence that defines who we become. Your book is meaningful and memorable, and thank you for writing it. It would have been interesting to see what would have happened to the A’s and the Reds if Free Agency hadn’t happened and they were able to keep those teams together. Thanks a lot, Patricia. Much appreciated! Anybody remember the 3-D baseball cards from Kellogg’s cereal? I know I have a 1974 Sal Bando 3-D card somewhere (and a few others). Love the blog Josh, lots of memories here as well. BTW, Bando did have a nickname: “Captain Sal”. OK, it’s kinda bland, but I think it works as the title for his 70s TV show. 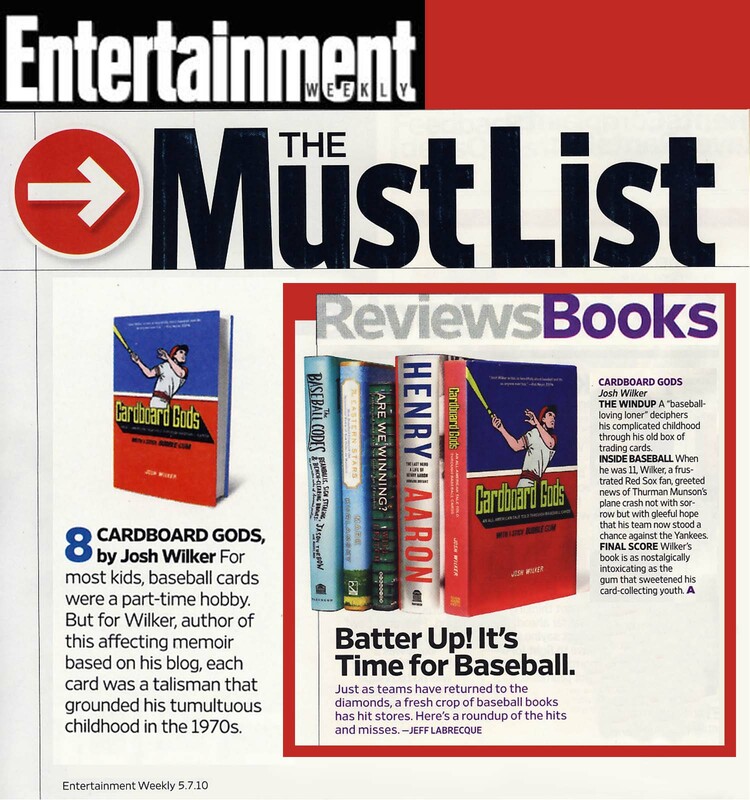 Toward the back of that same issue of EW they reviewed the book and gave it an “A”. Ten minutes after I finished watching an episode of “CPO Sharkey” the NYC blackout of 1977 occurred. I do remember the 3D Kellogg’s baseball cards. How people thought this would fool the Fuzz escapes me; a guy hunched over trying to stuff bud into the top of an obviously fake metal cigarette isn’t exactly conducting a covert operation. I am a lifelong Mets fan but loved Sal Bando, loved the A’s, and loved ’70’s baseball. I was rooting hard for Captain Sal in the ’76 AL home run race in which he finished tied for second to Nettles. Partly because I always felt he was overshadowed and partly because the winner was on the repulsive Yankees. Interesting that Nettles won that year with “only” 32 dingers and Sal tied for second with 27. Strangely low totals. I guess we got so used to the HR totals from the 90’s and the 00’s that we kind of forget that 30hr back in the 70’s was kind of a big deal and 40 hr was incredible. And no one hit 50HR in the American League in the 70’s or the 80’s. Jim Rice’s 46 in 1978 was the high water mark in A.L. in the 70’s. From 1970-1979 in the American League, 40+ HR were hit in a season only 5 times! From 1970-1979 in the American League, 35+ HR were hit in a season only 17 times! From 1970-1979 in the American League, 30+ HR were hit in a season only 44 times. The 70s were a period of low offense, for sure. From 1971-76, I think on three separate occasions the AL league leader in home runs had only 32. Hard to imagine such a low amount these days, but as late as 1989 Fred McGriff had 36 to lead the league.